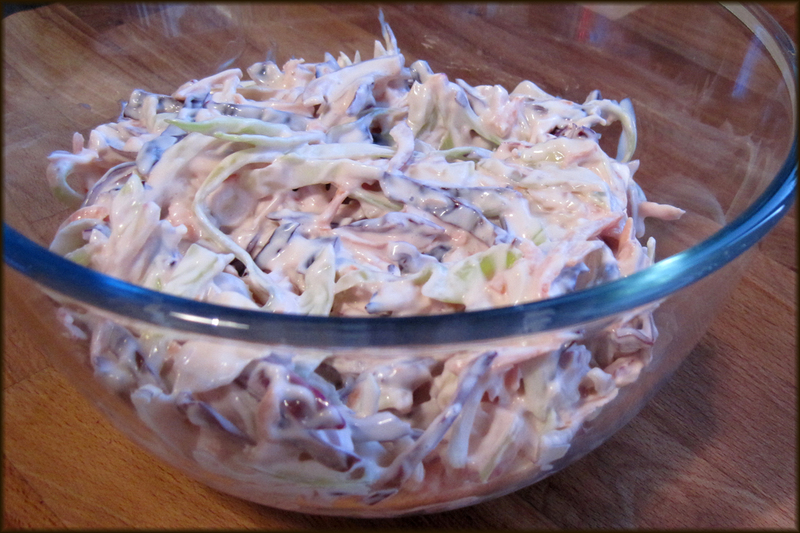 Coleslaw, easy to make for a Christmas or New Year's eve party. I used to hate coleslaw and couldn't think why anyone would want to eat such a thing! However, I suppose it's because I'd only ever encountered the stuff that comes in a plastic tub from the shop that was made at the very least, a few days ago. Now when you have a go at making it yourself you end up with something completely different. With the addition of a few bits and bobs to the shredded veg you can whip up a great big bowl in next to no time. If you are making it for a Christmas or New Years eve, party you can just double the amount. There are no exact list of ingredients, nor measurements. 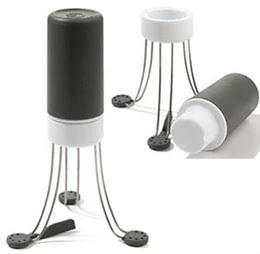 If you want precise measurements then this is not the place to find them. Just add whatever else you fancy. I always use Hellmann's mayonnaise as I think it really is the best out there, same with the yoghurt, 'Total' is the way to go. One thing to remember is don't make this any more than a couple of hours in advance or the cabbage will go nasty and taste like the stuff shops sell. Put the shredded white cabbage only into a bowl and pour over boiling water. Leave to stand for 5 minutes. Drain and run cold water over it till it's completely cold. Tip onto a nice clean tea towel and pat dry. 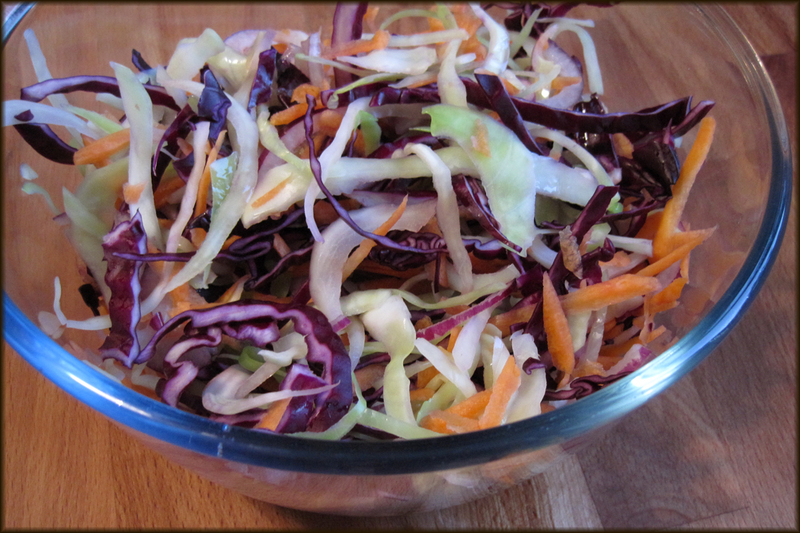 Put that along with the shredded red cabbage, onion, carrot and a small pinch of salt into a nice big bowl. Give it a good mix then add a dollop of natural yoghurt. Now add Hellmanns mayonnaise a dollop or so at a time, mixing as you go till you get the right amount to go with the amount of veg you have in the bowl. Taste so see if you need more salt, one final mix if you added any. Sounds lovely, Ages since I made Coleslaw, will give this ago today, to serve with last nights Pear and Black pudding pies. Thanks for sharing again. I love cole slaws and just as enjoyable without the mayo! You can never have enough recipes for a good coleslaw. This will be perfect for those that don't care for mayo. .... and the sultanas! My nana always used to add sultanas - they were my favourite part. Still are actually. You tried it with savoy cabbage instead of white? Makes it slightly different. 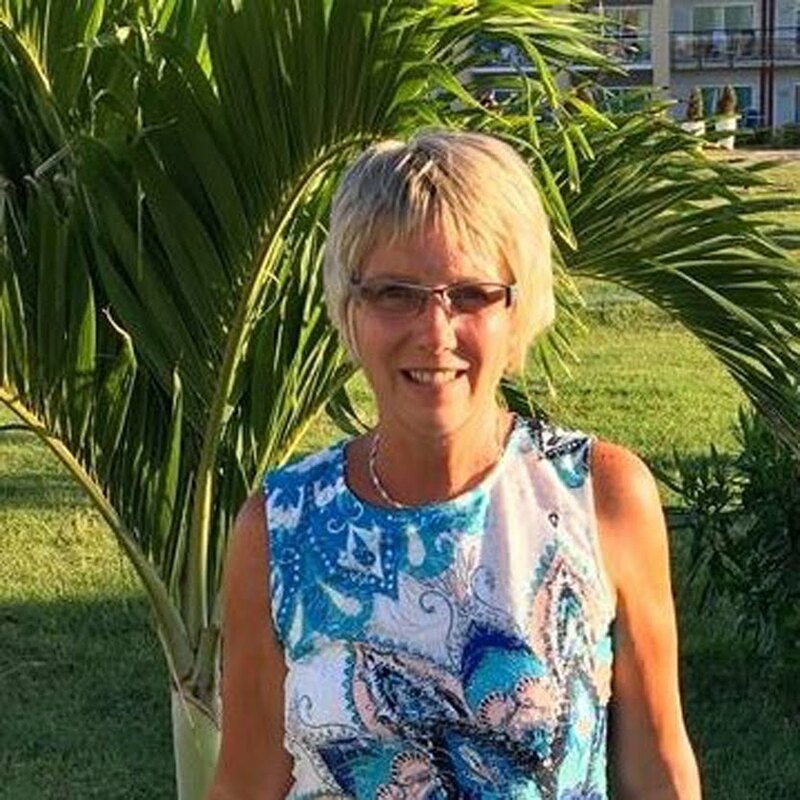 That coleslaw looks gorgeous, Jan! I've also never been a fan of it, having only encountered the processed, gloopy variety! Looks a lovely colour with the red cabbage in, maybe I should give coleslaw another chance!